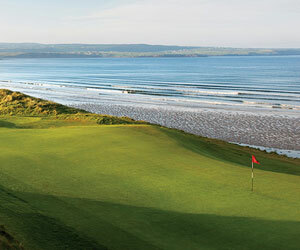 One of the finest links golf courses on Wales' south coast is Ashburnham Golf Club. It was originally established toward the end of the 19th century, and the course was upgraded by H.S. Colt in 1910. Since then, it's been host to some of Wales' top national tournaments, including the British PGA Championship. Holes three through eight all play into prevailing winds coming in off the coast, but the majority of the back nine plays with the wind at your back. The sea is mostly shielded by dunes, except for on the first and 16th tees, which both look out over the course and the water. Ashburnham is located in Wales' southwest and is a good value at 50-65 pounds for 18 holes and lunch. Ashburnham begins with a downhill par 3. The par-5 eighth hole is the last of six holes playing into prevailing winds. Teeing off on the ninth hole at Ashburnham Golf Club in Wales. A view of Ashburnham Golf Club in Wales. A coastal bike path to the right of the ninth fairway at Ashburnham Golf Club. The 17th tee and clubhouse at Ashburnham Golf Club. The downhill 16th hole at Ashburnham Golf Club. The 18th green at Ashburnham Golf Club. The 16th green at Ashburnham Golf Club in Wales.